The scandal involved forged documents reportedly used by an investment company to secure loans worth $2.6bn. The money was reportedly used to buy state-owned companies under the government's privatisation scheme. The BBC's Sebastian Usher said the firm at the heart of the scandal had moved from a small start-up capital to being worth billions of dollars. 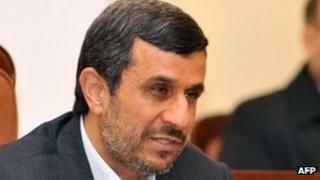 The affair fuelled weeks of political infighting between Mr Ahmadinejad and Iran's ruling hierarchy of clerics.